We’d love your help. Let us know what’s wrong with this preview of The Dancing Pancake by Eileen Spinelli. The grand opening of the Dancing Pancake isn't the only new thing in Bindi's life: new friends, a new apartment, maybe even a cute new crush? But there are other changes, like her dad's move to a new city, that have left Bindi confused and wondering: What will happen to my family? Will this new life e DELICIOUS PANCAKES!! The grand opening of the Dancing Pancake isn't the only new thing in Bindi's life: new friends, a new apartment, maybe even a cute new crush? But there are other changes, like her dad's move to a new city, that have left Bindi confused and wondering: What will happen to my family? Will this new life ever feel normal? Among the unlikely bunch of regulars who form a makeshift community at the diner, Bindi will try to figure out how to be a new version of herself, one pancake and one silly elephant joke (her uncle's specialty) at a time. To ask other readers questions about The Dancing Pancake, please sign up. What are bindi's pet peeves? There's something about Eileen Spinelli's writing that I just love. I can't put my finger on what exactly the quality is, just...something. She has a way of writing quiet little stories that have heart and hope. Her book Where I Live ranks among my top 10 favorites of all-time for kids, and now she has The Dancing Pancake, in the same vein. It's just a lovely little piece of work. Bindi's life is in an upheaval right now. Her dad has moved out, and now she and her mom and moving from their home t There's something about Eileen Spinelli's writing that I just love. I can't put my finger on what exactly the quality is, just...something. She has a way of writing quiet little stories that have heart and hope. Her book Where I Live ranks among my top 10 favorites of all-time for kids, and now she has The Dancing Pancake, in the same vein. It's just a lovely little piece of work. Bindi's life is in an upheaval right now. Her dad has moved out, and now she and her mom and moving from their home to a small apartment over the new restaurant her mother and aunt are opening. She's unhappy--she wants her father to come back home and for life to be normal again. -- it's written in easy-flowing verse, so the story moves quickly. -- Bindi is a real girl with real feelings. Sometimes she behaves in ugly ways or says ugly words, but she usually regrets that later. Her words and actions are all pretty spot-on for a young girl in Bindi's situation. -- Bindi and her mother attend church each Sunday. That in itself I find a good thing, but I especially like the way Spinelli writes about it as if it's just a regular, routine part of Bindi's life. It's not the focus of the book, but it is a part of who she is. And I like that, because that's me. That's my kids. It's much of America, but it's often left out of stories. So I was glad to see it included here. -- Bindi's homeless friend doesn't want a "home". When Bindi and her family and friends raise the money to provide an apartment for the lady, she soon abandons it--she can't see the stars on the inside. I found this a realistic portrayal of some homeless people today. Society tries to give them a safe, indoor home, and they just don't want it. We don't understand it (and neither does Bindi), but it's a life many of them choose. -- Bindi's dad doesn't come back home, but he does emotionally reunite with Bindi's mother. It seems to me that many books for children that deal with parental separation and divorce focus on how the child handles the finality of the divorce. And that's a good thing, because so many of our children are living that story. But there is hope for some marriages, and I thought it was nice to see that, for a change. Bindi is facing a lot of changes in her life. First, her father has left their family to find a job in another city. A few months later, she learns that her parents have separated. Now her mother and her aunt are starting a restaurant called The Dancing Pancake. They will be moving into the apartment above the restaurant and out of their house. As all of these changes hit, Bindi finds herself feeling sad and angry about them. People at the restaurant and her extended family help her deal with he Bindi is facing a lot of changes in her life. First, her father has left their family to find a job in another city. A few months later, she learns that her parents have separated. Now her mother and her aunt are starting a restaurant called The Dancing Pancake. They will be moving into the apartment above the restaurant and out of their house. As all of these changes hit, Bindi finds herself feeling sad and angry about them. People at the restaurant and her extended family help her deal with her feelings and show her the positive in her life. This verse novel features a full cast of interesting characters. The poems are written from Bindi’s point of view. She is a protagonist who is open and honest about her feelings, even when she is struggling with them. She offers readers a clear view of what children deal with when parents separate and life changes. At the same time, she is uniquely Bindi, a girl who loves to read, worries about what sort of friend she is, and tries to help others whenever she can. Spinelli’s verse is short and sweet. It has a clarity and understated feel to it that makes it very easy to read. Lew-Vriethoff’s illustrations have a breezy, effortless quality to them. They are simple line drawings that capture the moments in the book. The verse format and the illustrations throughout the book will make this a very inviting title for young readers. Highly recommended, this book strikes just the right balance between a girl’s life falling apart and a family ready to catch and hold her. Appropriate for ages 7-10. The Dancing Pancake by Eileen Spinelli is a novel told in verse about eleven year old Bindi trying to cope with her life being turned upside down. Her parents are separated and she and her mother are moving into an apartment over a restaurant which her mother is running the restaurant with a family friend. While I enjoyed the free verse style of story telling, the plot seemed rather derivative. There seems to be a glut of stories about single parents (usually mothers) running catering companies ( The Dancing Pancake by Eileen Spinelli is a novel told in verse about eleven year old Bindi trying to cope with her life being turned upside down. Her parents are separated and she and her mother are moving into an apartment over a restaurant which her mother is running the restaurant with a family friend. While I enjoyed the free verse style of story telling, the plot seemed rather derivative. There seems to be a glut of stories about single parents (usually mothers) running catering companies (or restaurants) while the fathers off having midlife crises. I'm thinking most specifically of the Regular Guy series by Sarah Weeks and Food, Girls and Other Things I Can't Have by Allen Zadoff (review coming). Besides the family drama plot, The Dancing Pancake has a bittersweet side story about a homeless woman named Grace. She usually has enough to order something from the fledgling Dancing Pancake restaurant but they usually give her something extra. Bindi, trying to find her own place in this new life she's living, befriends Grace and tries to do favors for her. Some of them Grace likes and others she doesn't. This part of the book is a far more interesting but understated discussion on homelessness and mental illness that the After School Special main plot. Lately I have really been enjoying novels in verse, but this one just didn't do it for me. Yes there were funny moments, touching and moving moments but what drove me crazy was the notion that kids are too young to understand grown up stuff. Bindi's life is in an upheaval. Her Dad left and her and her Mom are moving into an apartment above the Dancing Pancake, the diner that her Aunt and Mom are opening. Bindi has to learn to deal with her parents separation and new surroundings. In this process she becomes a little selfish and when Grace, the homeless customer points this out to her, Bindi remembers that everyone has problems not just her. So the summer is all about Bindi figuring out about herself, her mom and dad, her friends and just life in general. The dancing pancake is based on Bini and her family’s difficulties and her reactions to them. Her dad has moved out and she is living with mom. This book is very free flowing and focuses more like journal entries. It is fast paced read because of the structure. I really enjoyed this book because you really get to know Bindi and get an insight into her life. The good, bad and ugly from a child’s perspective. All in all the circumstances of her life enabled her to have a broader perspective. My 12 year old commented that she isn't really used to books written in free verse, but that she really liked this one. It's less verse more than it is broken down into short sections rather than chapters and they read well. Bindi is a believable girl. Her anger at her parents' separation, at the way her life is turned upside down by leaving her home to move into an apartment above her mother and aunt's new restaurant, her confusions over her feelings, are all very real. The minor characters are My 12 year old commented that she isn't really used to books written in free verse, but that she really liked this one. Heartwarming story about family, friends, community and that when we care and look out for one another, all will turn out alright. Keep the tissue box nearby... This book was warmly recommended to me by two of my fifth graders - thank you girls! You were so sure that I would love this book and you were absolutely right! Gawd I just freaking HATE when authors decide to write their books in verse. Whywhywhy???? It was quite a good story but got marks off for being IN VERSE. Cute. In poetry style. All is well that ends well. Bindi survives her parents and a move. she even dances in a pancake outfit to help the cafe. “In the Dancing Pancake,” Bindis mom is getting a divorce and then Bindi’s mom and her move into an apartment. Her mom needs a job and her aunt wants to own a restaurant. Will Bibi's new life work out and will her mom find a job or will her aunt's dream come true? Read the Dancing Pancake to find out. I would rate the Dancing Pancake 5 “stars”.The book The Dancing Pancake is a great book for kids 4th grade and up. I think this because 4th graders can really connect with this book. Also, it can r “In the Dancing Pancake,” Bindis mom is getting a divorce and then Bindi’s mom and her move into an apartment. Her mom needs a job and her aunt wants to own a restaurant. Will Bibi's new life work out and will her mom find a job or will her aunt's dream come true? Read the Dancing Pancake to find out. I would rate the Dancing Pancake 5 “stars”.The book The Dancing Pancake is a great book for kids 4th grade and up. I think this because 4th graders can really connect with this book. Also, it can really teach kids to not give up. And to be determined to accomplish your dream. You should definitely read this book because it teaches very good life lessons along the way I liked it because anyone can really fit into the main charters shoes. This book is also in verse and I love books that are in verse. All of the charters lead up to the theme with there are many charters in the book so you can see many different themes. I hope you will read The Dancing Pancake as I did. I loved this book! At first it was hard to get into because it is in prose. It looks like a poem, but it doesn’t necessarily rhyme. I hadn’t read a book like this for a long time. The other books I have read have been collections of poems, but this one actually tells a story and I thought it was nice. It's about growing up and making things work, even though it is different than you thought it would be. Bindi's mom and her aunt start a restaurant (and Bindi and her mother live above it). The restaurant helps Bindi find her place in this crazy world. The pictures and my imagination filled in the details. I enjoyed reading it. Easy read and enough drama to feel real. Good ending (although not cheesy perfect). It was great! Bindi's parents are having problems and Bindi's life gets dramatically changed. Her mother helps her sister-in-law set up and manage a new breakfast restaurant while angry Bindi tries to makes sense of her new life situation. Bindi finds that caring about and helping other people makes her life better and also helps her to feel better. I like how this mg novel is written, short chapters and easy dialogue that makes the characters easy to care about. Enjoyable to read. I liked that there were Christian themes without being overtly preachy, and I liked that the characters were admirable (unlike some that I have to explain to my son, "But we don't talk like that"). I'm exploring more novels in verse, and this one was great! Fun book about a young girl who battles with her parents separation, a new home, and a world where not everything is fair. Used this for Book Club for Kids at my library. Most kids liked it. One didn't because it was too sad. One girl related a lot to Bindi and really connected with her story. The Dancing Pancake is the restaurant Bindi's mother and aunt open after her parents separate and her father has left the house. It requires Bindi and her mother to move into the apartment above the new restaurant; the restaurant, however, is still in their town so it doesn't require Bindi to change schools or move away from any of her friends. Written in Spinelli's trademark free verse, there are some great characters in The Dancing Pancake: Bindi's friend Albert who is obsessed with bugs, Grace The Dancing Pancake is the restaurant Bindi's mother and aunt open after her parents separate and her father has left the house. It requires Bindi and her mother to move into the apartment above the new restaurant; the restaurant, however, is still in their town so it doesn't require Bindi to change schools or move away from any of her friends. Written in Spinelli's trademark free verse, there are some great characters in The Dancing Pancake: Bindi's friend Albert who is obsessed with bugs, Grace, the homeless woman who frequents the restaurant and Jackson, Bindi's irrepressible, much younger cousin. Spinelli does a good job of establishing Bindi's voice and her dilemma--one that is all too common for so many children stuck in the powerless, confusing middle of their parents' separation or divorce. Bindi's voice in the first third of the book is genuine and easily identifiable for young readers. The problem with the book is that it tries to be too many things and consequently ends up succeeding at none of them. It winds up being just an OK story for Bindi--you stop caring about Bindi's character after the first third of the book because the homeless character of Grace enters the picture and all of a sudden you get a lot of details about Grace's appearance and outward behavior, but no deep insights. The author lets go of the deeper connection with Bindi to write in the "regulars" at the restaurant and never quite recovers it to the level where it started. As a reader I tried to follow where the author was leading me but I just got lost and ended up feeling dissatisfied with the plot resolution for Bindi and lack of resolution to so many other characters. I like Spinelli's work in general, but I would recommend, instead, her work Where I Live, also written in free verse and much more effective in telling a compelling story about Diana, a young girl who is forced to move from where she LOVES living to a completely new place. It explores anxieties, new friendships and the premise that all change is scary, but isn't necessarily undesirable: all opportunities require courage and the rewards are tenfold! If you are interested in the subject of The Dancing Pancake: dealing with separation of parents, I recommend instead Patricia MacLachlan's Waiting For the Magic. The main character is a 4th Grade boy named William and the catalyst for healing and understanding are 4 dogs and a cat. 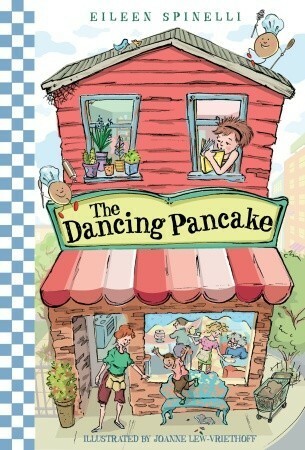 The Dancing Pancake is a 2010 novel in verse by Eileen Spinelli. I grabbed it from the gigantic piles of new books that were ordered when my new library branch opened, for two reasons. One: I really like novels in verse. As I mentioned in my review of Pearl Verses the World a couple of weeks ago, poetry gives authors more freedom to convey important or difficult emotions than does prose. They're also a lot easier and quicker to read, and I can usually finish one within a couple of hours. Two: Wh The Dancing Pancake is a 2010 novel in verse by Eileen Spinelli. I grabbed it from the gigantic piles of new books that were ordered when my new library branch opened, for two reasons. One: I really like novels in verse. As I mentioned in my review of Pearl Verses the World a couple of weeks ago, poetry gives authors more freedom to convey important or difficult emotions than does prose. They're also a lot easier and quicker to read, and I can usually finish one within a couple of hours. Two: When I was a kid, my mom worked in a coffee shop, and I have such fond memories of running around like I owned the place. I thought this book might portray a similar experience, and indeed, I was happily thrown into the world of restaurant regulars, and the sounds and smells of cooking in the air. Bindi's parents have recently separated and she and her mom have moved into the apartment above her aunt's new restaurant, The Dancing Pancake. As Bindi tries to make sense of her parents' separation, she experiences sadness and anger coupled with hope that they might work things out. She also interacts with the diverse cast of characters who work and eat at the Dancing Pancake, including her four-year-old cousin, Jackson, teenage waitress Ruby Frances, a homeless woman named Grace who eats meals in the restaurant, and a boy from school who might just be Bindi's very first crush. The strength of this book, definitely, is in its characterization. There are quite a few characters, and yet none of them is flat, or ignored. Everyone comes to life, and as a result, The Dancing Pancake becomes a vibrant and interesting character unto itself. Bindi is a sympathetic and realistic character, and particularly appealing is her desire to live out the values she has learned in church and do the right thing by the people she cares about. I'd never read anything by Eileen Spinelli before, but I would definitely like to read more now! I would also love to see more illustrations from Joanne Lew-Vriethoff, whose charming pen and ink drawings brought Bindi and her family to life in the white space surrounding each poem. I also absolutely loved the cover, and had only one complaint, which is that a plastic spider that figures heavily into the plot seems to be missing from the illustration. This book is NOT about a dancing pancake. That is what I thought when I checked out the eBook via the Media Mall. The name "dancing pancake" refers to a restaurant, instead of ballet-inclined breakfast. Which, I admit, was a little bit of a let down. What it IS about is a young girl dealing with her parents' separation. The rest of the story was so well done, that I didn't miss it after the first chapter. With gentle humor, sensitivity, and realism, the author deals with the realities of a changing family, the hope that things will return to normal, and the realization that nothing ever stays the same. The characters are relatable and likable. One important moment is when the young protagonist tries her best to make something nice happen for someone else. She is being completely selfless, she works hard, and she makes it happen. But she never once asked the other person if it was something she wanted. She was disappointed that what she wanted to happen, was not what was best for the other person. So although the parents happily (albeit hesitantly) get back together at the end, the reader goes with our young hero on the journey of disappointment when things do not work out exactly to her liking, and how to deal with change. I thought Bindi was a charming character, even with her flaws. (She's 11--they were completely understandable.) I loved how unfailingly supportive, patient, and loving her friends and family were in spite of her...moments. From someone who will forever have those moments, trust me on this--that support, patience, and love means the world!! I liked how things ended--realistic and yet happy and hopeful. I loved the characters, especially seeing them through Bindi's eyes. And the free verse worked wonderfully for this story, not bogging it down with too much detail or description and such. I should have known Eileen Spinelli--wife of the great Jerry (who made such a difference in my reading and writing life)--would not disappoint me. Staying up until midnight was worth it. Eileen Spinelli is at it again with a poignant and charming new tale! Written in gentle verse, The Dancing Pancake is told from the point of view of spunky Bindi, only child and reader extraordinaire. Her comfy normal life is quickly turned askew when her parents separate and her mother moves them into a small apartment building above the restaurant that she and Bindi’s aunt have just purchased together. Bindi soon learns that life above The Dancing Pancake can be filled with joy, however much s Eileen Spinelli is at it again with a poignant and charming new tale! Written in gentle verse, The Dancing Pancake is told from the point of view of spunky Bindi, only child and reader extraordinaire. Her comfy normal life is quickly turned askew when her parents separate and her mother moves them into a small apartment building above the restaurant that she and Bindi’s aunt have just purchased together. Bindi soon learns that life above The Dancing Pancake can be filled with joy, however much she might miss her father and her old house and old life and however mad and sad she might feel about all of the changes thrust upon her. The cast of waiters and customers who make up Bindi’s new community is a fascinating and fun one, especially bubbly waitress Ruby Frances, pesky little cousin Jackson, and homeless Gracie. With the help of her friends, Bindi finds that she just might be able to weather separation and syrup bottles and slime green bedroom walls just fine, even if her aunt does make her wear a pancake costume to attract customers. Funny illustrations by Joanne Lew-Vriethoff add spark to this is a warm and syrup-sweet story that’s great for middle and older readers. So who wouldn't want to pick up a book with a title like this one? Someone who didn't like novels in verse, I guess. Still, I'm not one of those people. So I liked it--and what's not to like about just about anything the Spinellis do? Bindi's best friend is named Albert. He knows bugs. She makes f So who wouldn't want to pick up a book with a title like this one? She makes friends with a homeless woman named Grace. Bindi's life is changing and not for the better if you ask her. Her dad has left. She thought to look for work, but no. Bindi's mom finally admits they have separated. Aunt Darnell loses her job and wants to open her own restaurant. The Dancing Pancake becomes a reality, but Bindi isn't sure if she likes this new direction her life is taking. What I thought: I loved it! The Dancing Pancake touched on some many pertinent issues for today's kids without being depressing or sad. This is the type of Bindi's life is changing and not for the better if you ask her. Her dad has left. She thought to look for work, but no. Bindi's mom finally admits they have separated. Aunt Darnell loses her job and wants to open her own restaurant. The Dancing Pancake becomes a reality, but Bindi isn't sure if she likes this new direction her life is taking. What I thought: I loved it! The Dancing Pancake touched on some many pertinent issues for today's kids without being depressing or sad. This is the type of verse novel I really like--titled poems function like small chapters. Bindi and crew (family, friends, etc.) were wonderful characters. I really liked Joanne's illustrations. They added quite a bit of humor to the story. They remind me of Louis Darling and Alan Tiegreen's illustrations of Beverly Cleary's Ramona books. My favorite poems are "Reading Chair," "House Mouse," "Miss Mole," "Another Hope Gone," and "Being a Pancake." Bindi's love of literature was great. It would be interesting to read all the books she mentions. This is a really good book. I'm not sure what to say because I don't want to include a spoiler of any kind. I read the first two pages at reading group and had to take it home. I finished in the next morning. Many children 8-12 will be able to relate to at least some part of this book. Mostly girls since the main character is a girl, but some boys would be able to read it too as the best friend is a boy who loved bugs. This is a tender story and oh so relevant to so much of today's society. I am This is a really good book. I'm not sure what to say because I don't want to include a spoiler of any kind. I read the first two pages at reading group and had to take it home. I finished in the next morning. Many children 8-12 will be able to relate to at least some part of this book. Mostly girls since the main character is a girl, but some boys would be able to read it too as the best friend is a boy who loved bugs. This is a tender story and oh so relevant to so much of today's society. I am not familiar with the author (I don't read many children's books) but I would not hesitate seeing what else she has. Also the illustrations are fantastic! I loved turning each page to see the illustrations. Very simple drawings, and yet so detailed and accurate. And relevant, the clothing the children wore is current and (happily) modest. These are topics touched in this book: divorce, homeless, moving, religion, friendship, helping others, working through problems, looking beyond your own life. I'm sure there are more but this is what comes to my mind right now. Later Albert and I walk home together. "They don't really bark," he says. "If one bit you, you probably wouldn't die. Bindi is struggling with life. Her parents are separated for reasons she doesn't understand. She is good friends with a couple girls and a boy, but the dynamics of the friendships seem to be undergoing a change. Her mother join her aunt and uncle in opening a cafe called The Dancing Pancake. All of these things together require her to move out of the house she has always known into an apartment over the restaurant. As she comes to terms with all the changes surrounding her, Bindi grows up and re Bindi is struggling with life. Her parents are separated for reasons she doesn't understand. She is good friends with a couple girls and a boy, but the dynamics of the friendships seem to be undergoing a change. Her mother join her aunt and uncle in opening a cafe called The Dancing Pancake. All of these things together require her to move out of the house she has always known into an apartment over the restaurant. As she comes to terms with all the changes surrounding her, Bindi grows up and realizes changes aren't always a bad thing.